BeautyFruityBlurbs: Mahira Khan Graces The Cover of Hello! Pakistan June 2013.. Styled By Yours Truly! Mahira Khan Graces The Cover of Hello! Pakistan June 2013.. Styled By Yours Truly! Please check out the latest issue of Hello! Pakistan to be released nationwide on the 16th of June!! 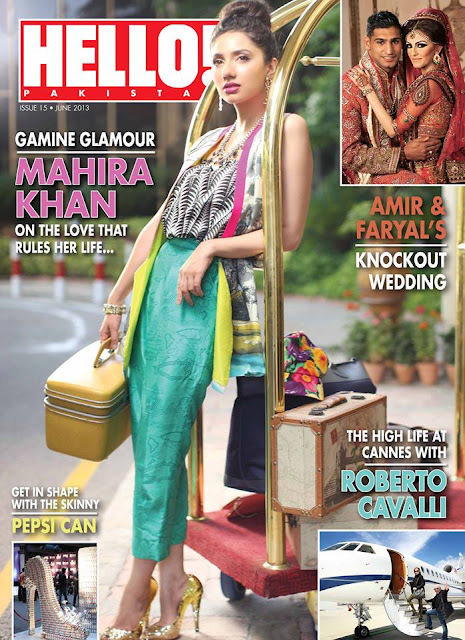 I have styled Mahira Khan in a way she has never been seen before - a variety of fabulous looks!! In the look below she is wearing a Sania Maskatiya ensemble from the Naksh collection with sequenced Miu Miu peep toes, carrying a vintage Samsonite vanity (this was originally my moms).. Her make up and hair is done by Natasha Salon. Grab your copy asap!! I will be posting some behind the scenes pictures as well!! I hav read all your posts to date and you keep promising stuff like I will post a ppst about this soon etc which I cant see! Dont keep us hanging! It might be a good idea to sometimes play around with your hair as all you ever do to it is umm nothing! would like to see more variety maybe? Every thing is too brand/label-ed. Them posts are brilliant but maybe post stuff that is vintage and how to style it? Here is what I love about your blog: SHOES!!!!! comments apart, well done on keeping us updated on pakistani fashion/style. Thought you might like some inspiration from one of the biggest bloggers in the uk: beautycrush, fashionfilth, tanyaburr, clothesencounters etc.